WOODVILLE, Ala. -- It's a feeling that most parents can relate to. 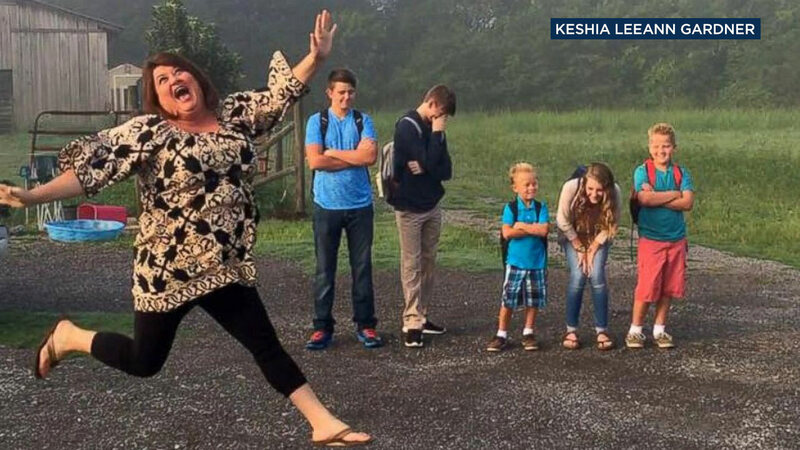 In the family's annual back-to-school photo, mother Keshia Leeann Gardner is seen literally jumping for joy as her children look bummed. One even has his hand covering his face in disdain. The happy mom captioned the now viral photo, "Happy 1st day of school kids. I'm gonna miss y'all." Gardner, 39, told ABC News that she is hamming it up for the camera. Still, the photo is meant to "make my friends laugh and cheer them up because [some parents] have a really hard time letting their babies go." It's also an annual tradition beloved in her family. Indeed, this is the "fourth or the fifth year" they've taken a photo like this one, the Woodville, Alabama, woman said. "I actually was not going to do it this year because I had gotten sinus infection and I didn't feel well with the chaos of the first day of school," she explained. "I was running late to work ... and I was like, 'OK, let's go!' And they said, 'We have to take a back-to-school picture. It's our tradition.'"